Troffer Retrofit Kits - Revolution Lighting Technologies, Inc. LED Troffer Retrofit kits are an excellent way to achieve instant savings and aesthetic upgrade. Our LED Troffer Retrofit Kits with 0-10V dimming are significantly more efficient than traditional fluorescent lighting. These kits are easy to install and make the process of upgrading outdated lighting relatively simple. What are Troffer Retrofit Kits? 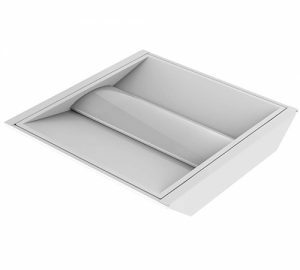 A troffer is a rectangular or square light fixture that fits into a modular dropped-ceiling grid, predominately 2’x2’ or 2’x4’. If a building was constructed in years prior to the 2000s, the troffers in that building most likely contain antiquated and energy-wasting lamps such as fluorescent tubes. Troffers typically provide a noticeably upgraded, stylish look, superior light quality, and immediate energy savings. Some kits cover the old troffer completely, while others simply line the fixture housing. Revolution Lighting’s Single-Barrel LED Troffer Retrofit Kit is designed for direct insertion into an existing troffer housing. Lift the Retrofit Troffer and push the thumb latches into place. Result: A quick transformation of your old fixture into a modern, stylish LED single barrel troffer that is 50% more efficient than fluorescent lamps and comes with a 5-year warranty. 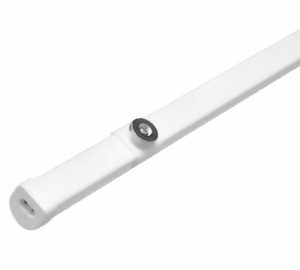 Revolution Lighting also offers two other LED retrofit options that attach to the fixture housing itself: the Tubular LED Troffer Retrofit Kit and the Magnetic Strip-lighting Kit. Both of these retrofit kits come with their own driver, and both use powerful magnets that securely hold them in place to the fixture housing. Installation is even simpler than with single barrel troffer retrofit kits. Alternatively, LED Troffer Retrofit Kits are suitable for use as LED accent lighting.